Auto accidents, falls, and other traumatic events can cause injury to the spine. 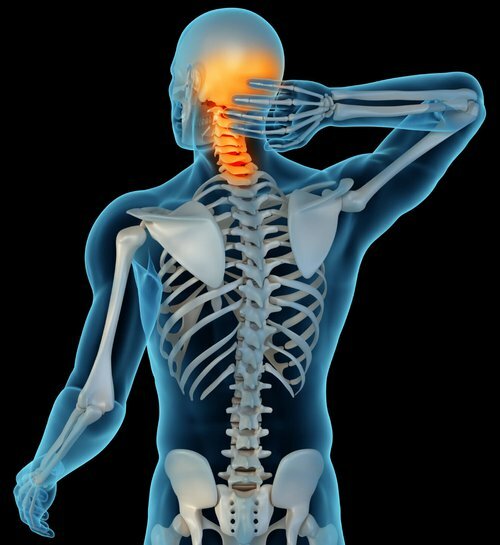 Injury can be caused by blunt force trauma (e.g., parts of the body striking the interior of the car) and/or by abnormal movement of the spine caused by collision forces. The spine is referred to in three segments: cervical (neck); lumbar (low back); and thoracic (between the cervical and lumbar). The spine provides the vertical structure and support for the body and also acts as the conduit for the spinal cord which runs from the brain down through the spine with nerve roots branching off at every level of vertebrae and running to every part of the body. Electro-chemical signals are sent back and forth from every part of the body to and from the brain. The proper functioning of the brain and the body are dependent upon these signals being transmitted correctly. Also, these signals provide us with useful information (e.g., The stove is hot. Move your hand!). When a part of the spine is injured, signals – including the feeling of pain – are transmitted to the brain. The body, in conjunction with the brain, then reacts in various ways to protect us (e.g., immobilization: when the neck is injured, the neck muscles may not let us move our neck very much until it is healed sufficiently to resume normal movements). A very common mechanism for spinal injury is rear-end collisions. In a rear-end collision, a stopped vehicle (target) is struck by a moving (bullet) vehicle. As you may remember from science class, all energy is conserved; there is no loss of energy in any action. As applied to a car crash, that means that the energy (momentum) of the bullet car is transferred to the target car. The target car is almost instantly propelled forward by the collision, but the driver experiences a slight lag (micro-seconds): his or her body is not propelled forward but the driver’s head lags behind as the body is knocked out from under the head. The head extends (and hyperextends if there is no headrest) until its movement is stopped by the maximum range of the neck (unless stopped earlier by the headrest) and then it whips forward (hence the term “whiplash”). The body’s forward movement is stopped either by the seatbelt or by the steering wheel. When the body stops, extra momentum is transferred to the head as it is moving forward (flexion) increasing its speed until it is stopped by the maximum range of the neck (hyperflexion) or by the head hitting the steering wheel or interior of the car. (Seatbelts prevent or reduce injury from the body and/or head striking the interior of the car but increase the severity of injury to the cervical spine due to the abnormal movement of the spine). Until a few years ago, it was thought that the cervical injuries experienced in rear-end collisions were caused by the hyperextension/hyperflexion of the cervical spine. However, recent research has demonstrated that spinal injuries are most likely caused by abnormal movements of the spine and abnormal pressures generated in the spine by compression. The normal movement of the cervical spine is a smooth arc. However, in a rear-end collision, the cervical spine moves in an “S” curve. That is, the lower segment is propelled forward with the upper segment lagging behind: an “S” is formed in the spine. The joints of the vertebrae (the facet joints) do not move together in a smooth arc but instead slam together, which can cause injury. As the spine is formed into an abnormal S cure, the discs (shock absorbers between the vertebrae) are compressed. Compression can cause injury in two ways: (1) If the compression is severe and the disc is weak, then the disc material may stretch and/or tear (in extreme cases the disc may rupture); and (2) compression causes electro-chemical changes in the brain. The effects of spinal injury range from slight (minor neck stiffness) to catastrophic (paralysis or even death if, for example, the spinal cord is severed).